Brandt Peters exclusive SDCC signing and print at Kidrobot! Hold on to your bowties because Brandt Peters is making a triumphant return to the San Diego Comic Con with Kidrobot! 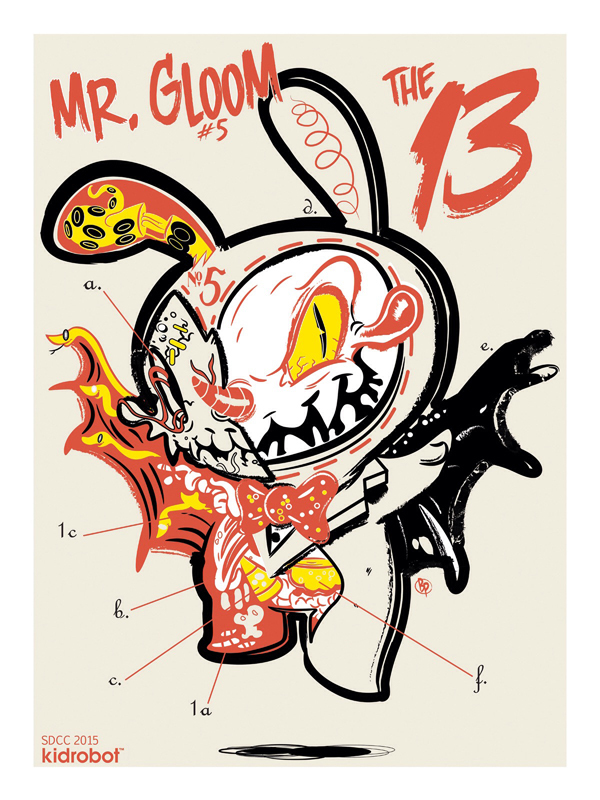 Kidrobot will feature a limited edition numbered and signed premium “Mr. Gloom” Dunny #5 screen print by Brandt available for purchase at the booth. Prints will be produced in runs of less than 200 pieces and commemorate Kidrobot’s 2015 SDCC appearance. Each screen print will retail for $25. As a special San Diego Comic Con feature, the first 50 fans in line for each of their signings will receive a free screen print. Now Mr. Gloom may seem very familiar because he is part of the highly anticipated upcoming Dunny series by Brandt and kidrobot entitled “The 13” (available for preorder with a special gift from Brandt right here). This limited print is a perfect accoutrement to adorn your walls with the Dunny series.